Help sustain California ReLeaf for generations to come. 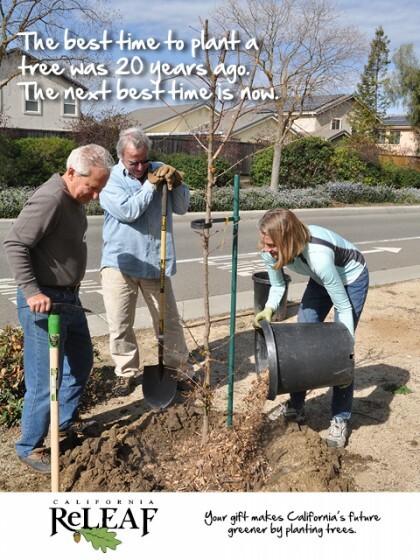 A planned giving gift assures that California ReLeaf will be able to continue to support urban and community forests in California for our state’s future. Please consider naming California ReLeaf as a beneficiary in your will, life insurance policy, charitable gift trust, or other mechanism. Please consult a financial advisor or estate planning attorney to learn more about what plans may work best for you. You can download a California ReLeaf planned giving brochure here, or if you would like to have a brochure mailed to you, please contact us at 916-497-0034 or email us at info@californiareleaf.org. California ReLeaf is a 501(c)(3) tax exempt organization. Our Federal Tax Identification number is 90-0138904. For more information about making a donation to California ReLeaf contact Cindy Blain, Executive Director, at 916-497-0034 or cblain@californiareleaf.org.